Back in the pre-Internet days, kids who loved to learn found particular joy in the World Book Encyclopedia—a blue-spined collection of volumes, filled with information about just about everything, that could be found in most school libraries across the land. Geo Walk-3D World Fact Book should hold similar appeal to the newest generation of precocious, iPhone-savvy students. The most appealing part of the $1 app from Vito Technology—and its $3 iPad counterpart, Geo Walk HD—is the user interface. (Though “3D” is a bit of a misnomer; the apps feature well-rendered interactive images, but no glasses are required.) A globe fills the screen, which you can spin back-and-forth or up-and-down, revealing a series of location-based flash cards. Tap a card and you’re given a picture of a person, a plant, an animal, or a landmark associated with continent or country you were viewing. Tap the picture, and it flips over to reveal a few sentences describing the person or object. 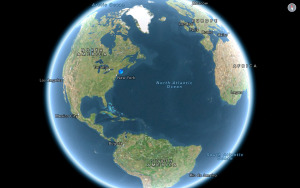 Take It for a Spin: Both the iPhone and iPad versions of Geo Walk feature a globe interface. Tap one of the cards on the globe to find out more about a person, plant, animal, or landmark. You aren’t confined to the globe view, neat as it is. You can also view the flash cards as a rotating series of pictures. (Tap the star on a picture, and the item will be pinned to a virtual bulletin board in the background of the app’s homepage.) 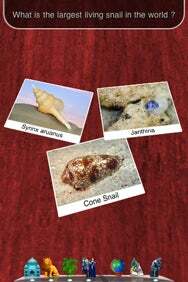 Geo Walk also contains a quiz mode, which poses a question and offers images as multiple-choice options for the answer. Because the app doesn’t rely on Internet access, these features could make a great diversion for young students on a long car ride. Pop Quiz: Geo Walk’s quiz mode poses questions with images as multiple-choice answer options. Geo Walk HD, meanwhile, is the exact same app—there are no discernible differences in content or layout—but it costs three times as much as the iPhone version. In such cases, I’d normally put the iPhone offering on my tablet and accept the slightly grainy resolution you find in phone apps blown up for iPad use, but this appears to be a rare case where that approach doesn’t work. The border areas of the Geo Walk for iPhone app are lost when installed on the iPad, omitting access to important parts of the navigation. If you want to run Geo Walk on your iPad, you should use the tablet-optimized HD version. Both versions suffer from the same problem: there are only 500 factoids in the whole system. That makes it easy to get bored with the app quickly, and it leads to some unfortunate choices. 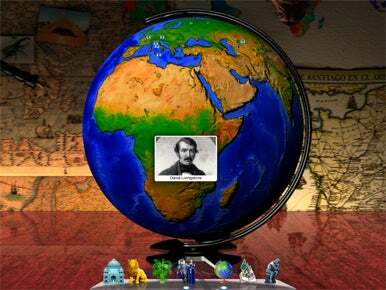 According to Geo Walk, there’s only one human in the history of the African continent worth mentioning—and that’s a white guy, David Livingstone. Vito Technology is planning a Geo Walk update, however, that will add a news layer featuring significant current events around the globe, which figures to increase the amount of content contained in the apps. Besides, what content is there now is fun and easy to use. Smart kids, however, might find themselves pining for an old World Book Encyclopedia.